The original Cherry Hall was a building owned by Tom Williams. It was leased at $25 per month for a period of 3 years to serve as a dormitory. A dining room was added in 1908 at a cost of $1500 partially paid for by the residents through rent. 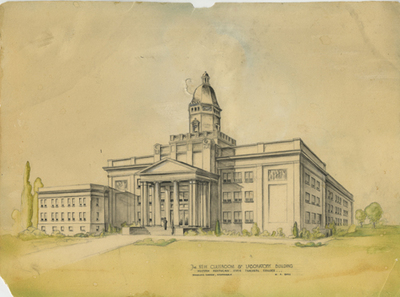 The current Cherry Hall was built on the site of Recitation Hall which was originally Potter College, an all women's college in the late 1800's, The building was dedicated on Founders Day, Nov. 16, 1937. Cherry died August 1 before the dedication. The three story building has a "temple front and columns of the Ionic order" [Historic Architecture at Western Kentucky University]. It has two wings that extend at the back of the building. When it was first built, the building was used for all academic classes, chemistry and physics department laboratories, and the college bookstore, post office and various other offices. 1957 - Chimes were installed in the tower at Cherry Hall. The 25 chimes "could be played manually in room 301 of Cherry Hall. Their tones were picked up by microphone and transferred to speakers in the towers. [Cherry Hall Chimes] They sounded on the half and quarter-hours. On the hour the Westminster chime sounds.